March 11, 2010 - On Wednesday aviators, friends and family members gathered for a Congressional Gold Medal Ceremony to honor the achievements of the first women to fly military aircraft during World War II, the Women Airforce Service Pilots (WASP), 1,102 pilots. The event was held at the United States Air Force Memorial located in Arlington, Virginia, on the grounds of Fort Myer near the Pentagon. About 200 WASPs and more than 2000 representatives of those who could not attend for health reasons or deceased attended the ceremony to accept the Congressional Gold Medals. The Women Airforce Service Pilots (WASP), and the predecessor groups the Women’s Flying Training Detachment (WFTD) and the Women's Auxiliary Ferrying Squadron (WAFS) from September 10, 1942, were pioneering organizations of civilian female pilots employed to fly military aircraft under the direction of the United States Army Air Forces during World War II. The female pilots would number in the thousands, each freeing a male pilot for combat service and duties. The WFTD and WAFS were combined on August 5, 1943 to create the para-military WASP organization. 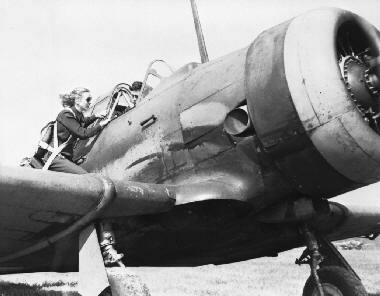 By the summer of 1941, the famous women pilots Jacqueline "Jackie" Cochran and test-pilot Nancy Harkness Love independently submitted proposals for the use of female pilots in non-combat missions to the US Army Air Forces (USAAF, the predecessor to the United States Air Force or USAF) after the outbreak of World War II in Europe. The motivation was to free male pilots for combat roles by employing qualified female pilots on missions such as ferrying aircraft from factories to military bases, and towing drones and aerial targets. Leading into Pearl Harbor, General Henry H. "Hap" Arnold, commander of the USAAF, had turned down both Love's 1940 proposal and the proposal of the better connected and more famous Cochran despite unsubtle lobbying by Eleanor Roosevelt, but essentially promised command of any such effort to Cochran, should such a force be needed in the future. The U.S. was building its air power and military presence in anticipation of direct involvement in the conflict and had belatedly begun to drastically expand its men in uniform. This period had led to a dramatic increase in activity for the U.S. Army Air Forces, and there were obvious gaps in "manpower" that could be filled by women. However, it was not until after the attack on Pearl Harbor brought U.S. armed forces into the war that it became evident there were not enough male pilots. To those most involved within the USAAF, especially in the new Ferrying Division of the Air Transport Command (ATC), the numbers were painfully obvious. Ferrying Division commander Brig. Gen. William H. Tunner, in charge of acquiring civilian ferry pilots, decided to integrate a civilian force of female pilots into the AAF after speaking with a fellow ATC staff officer, Major Robert M. Love and his wife Nancy. Tunner, convinced of the feasibility of the program by Mrs. Love, who had a Commercial Pilot License, asked her to draw up a proposal, unaware that Arnold had shelved a similar proposal by Tunner's superior, Maj. Gen. Robert Olds. By mid-summer of 1942, Arnold was willing to consider the prior proposals seriously. Tunner and Love's plan was reviewed by ATC headquarters, and forwarded by now-commander Gen. Harold L. George to Arnold, who was fully aware of it and gave it his blessing after Mrs. Roosevelt suggested a similar idea in a newspaper column. The Women's Auxiliary Ferry Squadron (WAFS), headed by Mrs. Love, went into operation on September 10, 1942. Soon the Air Transport Command began using women to ferry planes from factory to air fields. Retired U.S. Coast Guard Vice Admeral Vivien Crea, was the keynote speaker at the service. He told those present that by answering America’s call to duty in 1942, they gave birth to a fledgling service that would become the WASPs with achievements that would go on to inspire another generation of women in the military. “As aviators, you possessed an invaluable capability that our nation desperately wanted,” Crea said. “You joined not because you were great pioneers, but because of your great sense of duty. You served America in its time of peril.” The 20th Fighter Wing from Shaw Air Force Base, in South Carolina performed a flyover in the “Missing Man” formation.